Fundamentals of 5G Mobile Networks provides an overview of the key features of the 5th Generation (5G) mobile networks, discussing the motivation for 5G and the main challenges in developing this new technology. This book provides an insight into the key areas of research that will define this new system technology paving the path towards future research and development. The book is multi-disciplinary in nature, and aims to cover a whole host of intertwined subjects that will predominantly influence the 5G landscape, including the future Internet, cloud computing, small cells and self-organizing networks (SONs), cooperative communications, dynamic spectrum management and cognitive radio, Broadcast-Broadband convergence , 5G security challenge, and green RF. 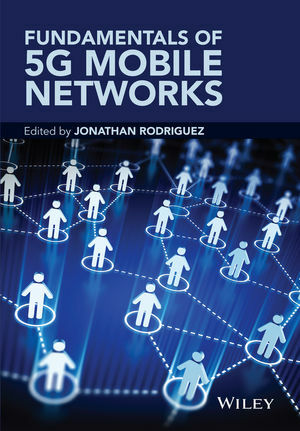 This book aims to be the first of its kind towards painting a holistic perspective on 5G Mobile, allowing 5G stakeholders to capture key technology trends on different layering domains and to identify potential inter-disciplinary design aspects that need to be solved in order to deliver a 5G Mobile system that operates seamlessly.